Nick Dudka is a contemporary German born artist, currently living in Russia, who has become a modern proponent of the traditional Tibetan Buddhist art of the thangka, or scroll painting. After formal training in Western art in Ulan-Ude, Russia and at the Academy of Art in Kiev, Dudka became interested in the spiritual and artistic traditions of Tibetan Buddhism and studied thangka painting over many years, in numerous visits to Mongolia, Nepal and India. Thangkas are painted on linen or cotton, and occasionally silk, prepared with animal glue and talcum, stitched along the edges and stretched on a frame. This is similar in some respects to the European tradition of painting on cotton or linen canvas stretched on a frame and prepared with animal skin glue and chalk whiting (gesso). The pigments are from sources like malachite and cinnabar, and are mixed with animal glue and ox bile. The galleries on Dudka’s site include some of his preliminary charcoal drawings. Thangkas are most often of religious subjects, portraits of Buddhas, and stories from the lives of other religious figures. The images are a striking mixture of figurative and decorative elements. Alive with intricate detail, swirling eddies of texture and color are contrasted with anchored elements of preternatural stillness. Fierce, tranquil or blissful deities gaze out at you from amidst the push and pull of these polar forces of stillness and motion. The image shown at left, and in detail at bottom, is of Palden Lhamo, a fierce protector diety, and one of the few female figures in the major group. She is the Tibetan version of the goddess known as Shri Devi in India. The figures are sometimes cast as giants atop small floating islands, in streams swirling with their own eddies and currents, and arrays of lotus blossoms, all indicative of elements in Buddhist teachings. The stylized clouds that often fill the backgrounds also have suggestions of swirling moment, suggesting invisible currents in the air, along with dramatic roiling masses of flame, smoke or other elements, intertwined with the flowing robes and garments of the figures. In contrast to all of the movement and dynamics are large decorative elements, often surrounding the figures with large golden “halos” that are tempting to compare to the halos surrounding religious figures in European art. I don’t know enough about thangka painting to make an informed comparison between Dudka’s contemporary versions and traditional paintings. You can see some traditional Thangka paintings on Exotic India, Buddahnet and Circle of Bliss. 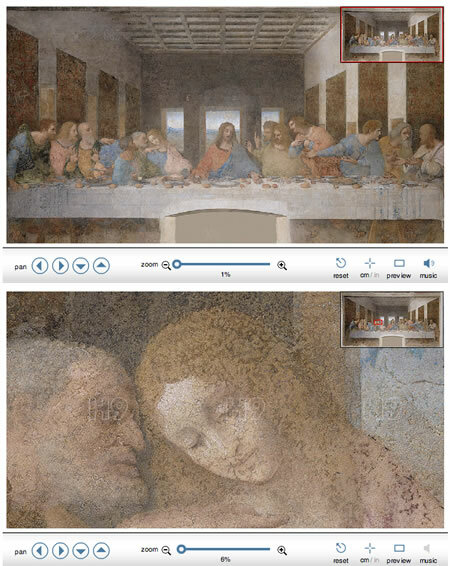 OK all you conspiracy buffs and fans of The Da Vinci Code, here’s your chance to get all up close and personal with the master’s famous fresco from the comfort of your computer chair. The folks at Haltadefinizione, who previously posted zoomable ultra-high resolution images of Gaudenzio Ferrari’s wonderfully intricate Vita di Cristo, and Andrea Pozzo’s amazing trompe l’oeil vault, Gloria di Sant’Ignazio, at 8.6 and 9.8 gigapixels respectively, have posted a new 16 (count ’em!) gigapixel image of Da Vinci’s The Last Supper. To give you some idea, that’s 1,600 times higher resolution than a typical 10 megapixel digital camera. You can get down to the level of examining individual chips of plaster if you want, but you’ll probably want to stay out at about 6-10% of the potential magnification just to be able to see recognizable parts of the image. Actually, I find the hi-res version of Pozzo’s ceiling more rewarding to explore this way, flying in and out through his imaginary sky. The controls allow you to immediately turn off the inexplicable music, zoom and scroll, and even tuck the smaller preview window out of the way. Intended to make examination of the painting possible for numerous scholars, particularly amid some controversy about Milan’s ability to protect the work, which has deteriorated seriously, from the city’s severe pollution problem, the image has been made available to the public, and you can zoom, scroll and examine to your heart’s content. Leonardo reportedly used some experimental techniques in the painting, diverging from the traditional methods of fresco that have made it one of the most durable painting methods known to mankind, with unfortunate results. For those interested in the pop-culture phenomenon of the Dan Brown’s book and the atrendant movie, you can zoom in on the figure to Christ’s right and see that it is pretty easy to interpret it as feminine. Also, if you print the image out on a vinyl disc and play it backwards on a phonograph, it says “I buried Paul…”. When thinking about “plein air” painting, which is simply a French term for painting out of doors, the thought is naturally one of landscape. 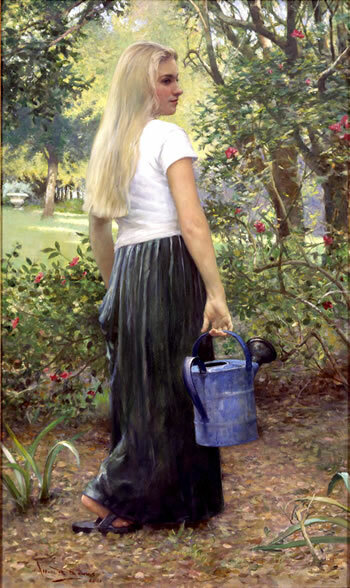 More unusual is the practice of plein air portrait painting, as practiced by classical realist painter Allan R. Banks. The infrequent pursuit of this approach is understandable. The usual controlled lighting and background conditions, employed to make portrait painting easier, are replaced with the much harder to manage background integration (painting essentially a portrait and a landscape) and the fleeting lighting conditions inherent to outdoor painting. The result of taking on that challenge, however, is a refreshingly different kind of portrait. Banks works in the tradition of academic painters from the late 19th Century who also did notable figutative works set in landscapes, like Jules Bastien-Lepage and Daniel Ridgeway Knight, as well as “impressionistic” realists like Sorolla and Sargent. Banks studieed with noted painters Richard Lack and R.H. Ives Gammel and has achieved notice in realist and naturalist painting circles and has for some time been the President of the American Society of Classical Realism. His essay, Clarion Call, from the Classical Realism Journal, is prominently reprinted on the Art Renewal Center, which also features a gallery of his work. For a number of years his web presence has been a section at classicalrealism.com, which is essentially an extension of the Gandy Gallery. Those pages have apparently not been updated for a few years, and Banks has a new site at allanbanks.com. Though the new site is notable for having newer works, the older presence is still relevant as the new site is apparently suffering some newbie pains, like galleries without thumbnails and some incorrect links. One of the problems, though, turns out to be a plus. What I thought at first was a slow sever connection, resulting in glacial page loading even over high bandwidth, turned out to be the result of a common amateur web design mistake of resizing large images in the HTML rather than providing correctly sized images for the pages, linked to larger ones. Also, whoever is doing the site is posting huge, uncompressed BMP files instead of compressed JPEGs. Much to my delight, however, the images that are posted are large in physical size as well as file size, which is one of the areas where many artist’s sites fail, providing images that are too small to really get a good impression of the work. If you contextual-click on the images on Banks’ new site and open them in a new window, you’ll find many of them are large enough for you to actually get a real feeling for the appeal of his work; which is beautifully handled, rewarding in the details, and surprisingly painterly; characteristics that smaller images don’t reveal. Hopefully, the new site will eventually get thumbnail navigation and correct image file handling, but I certainly hope the large images of Banks’ paintings remain. You will also find some reasonably large images of Banks’ work on the Art Renewal Center. In addition to his plein air portraits, Banks paints more traditional indoor portraits, plein air compositions in which the landscape is dominant (thought they usually also include figures) and still life. Banks often chooses the subdued lighting of overcast days or places his figures in shadow, perhaps partially for the easier handling of diffused outdoor lighting which doesn’t change as dramatically in short periods of time as direct sun, but perhaps more to be in keeping with that practice among the artists who have worked in that tradition. 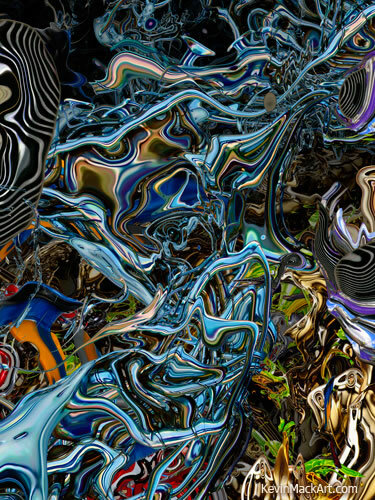 Kevin Mack’s digital compositions are like a roller coaster for your eyes. You glide into them on big swooping forms that recede into the depths, looping and swirling among themselves like the veinous system of an android, or vibrating into a crenulated landscape of primary colors. As you go further into the images (and “into” is the operative word), traceries of liquid strands twist around floating islands of Henry Moore forms, and sinuous wires multi-colored quicksilver explode into blossoms of robotic flowers. If I seem to be waxing poetic, it’s because Mack’s images are conducive to the kind of dreamlike interpretation and “animals in the clouds” visions that are characteristic of the fantastical landscapes of Max Ernst or Robert Venosa; sort of a hyperdimensional Jackson Pollock on digital steroids, or Yves Tanguy in a blender. It’s hard for me to look at these and not think of them as digital sculptures, and marvel at how fantastic they would be if they could be made into actual physical objects that you could walk around (or through). Mack creates his images digitally using mathematical models that are the outgrowth of his work as a film industry concept and matte artist, which led to work in “artifiical life” and rule based systems that can be used to “grow” 3-D CGI forms based on sets of programming criteria. His work in that area was utilized in films like What Dreams May Come and Fight Club and inspired the development of software that is being used to simulate the growth of biological tissues for virtual stem cell research. Mack is the child of two Disney artists and studied Fine Art, Illustration and Film at the Art Center College of Design. He is now an Academy Award wining Visual Effects Supervisor and received the Oscar for his work on What Dreams May Come. His other film credits include Vanilla Sky, Apollo 13, The Fifth Element, Big Fish and A Beautiful Mind. Mack’s digital pieces are produced as limited edition giclee prints (image above: Neurosymphonic Self Reflection, 36 x 48″ giclee print on canvas). His digital art has been exhibited at The Los Angeles Center for Digital Art, Siggraph, and Sony Pictures Imageworks. 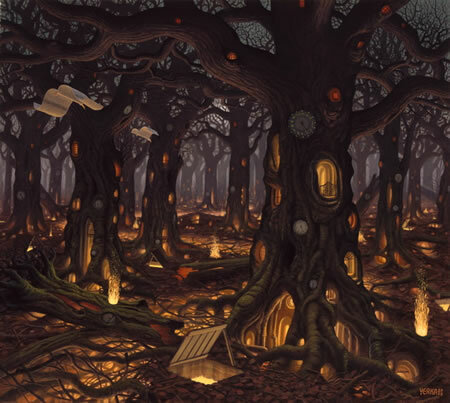 The temptation is there, of course, when attempting to describe Jacek Yerka’s fantastical and dreamlike paintings, to use the term “surreal”. I will persist, though, in my cranky insistence on reserving that term to refer to a specific group of artists, and the devotion to images derived from the unconscious that was their manifesto. So I’ll use “magic realism” to refer to Yerka’s visions of doorways to other worlds, disorienting juxtapositions of scale, brain-tickling suggestions of relationships between the seemingly unrelated, and clever manipulation of perspective, proportion and other visual cues. I wrote about Jacek Yerka back in 2006. Since then, he has acquired a domain name, yerkaland.com, and handed maintenance of his site over to others, and the site has been revised and updated. My other post still has relevant links to books and other galleries. Unfortunately, I think the new site is a bit more scattered in the presentation of images than the old one. You will find several pages (links at the bottom) of images in the Giclee gallery as well as in the How do I create my paintings page, as well as in the My worlds and Art for sale sections. The Art for sale section has the largest reproductions. There is also now a Jacek Yerka gallery on beinArt Surreal Art Collective, and I came across a nice article with images on Dark Roasted Blend. Interestingly, Kansas illustrator Jack Unruh divides his online portfolio into two enigmatically defined sections, What is real and What is not real. 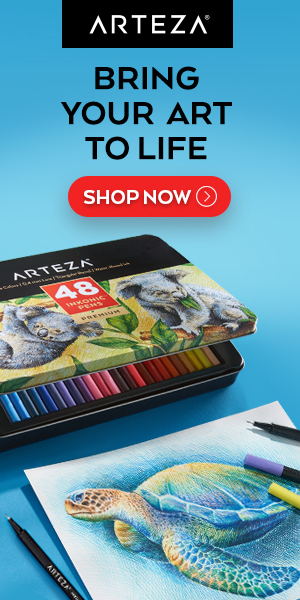 Presumably, the latter has more conceptual and imagination based illustrations, although in both you will find his wonderfully drawn portrait/caricatures of well known figures, images of fish, bears and other wildlife, and scenes of a variety of things and places. Unruh has a passion for the outdoors, and fishing in particular, judging by the many illustrations of specific species of game fish in his Prints and Stock sections. 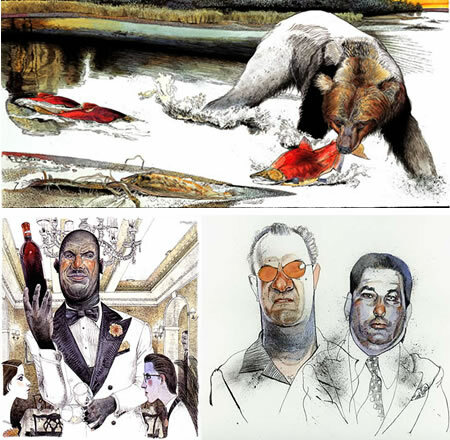 His illustrations have appeared in Field and Stream, Sports Afield and Sports Illustrated, as well as a roster of major periodicals like Atlantic Monthly, Rolling Stone, Time, National Geographic and New York Magazine. He also has done illustrations for numerous corporate and advertising clients. His illustrations have had a continuing presence in graphic arts magazines like Communication Arts, American Illustration, Graphis, AIGA and Print, and he also has a well deserved list of awards from the Society of Illustrators and others. Unruh’s approach looks like a combination of pen and ink and watercolor. His pen and ink underdrawing often has stippling and texture not often present in drawings that are intended for the application of color, and he will frequently leave parts of the pen and ink drawing uncolored, leading to a really interesting blend of the two types of image. Your eye goes back an forth from islands of color to pen and ink textures in a visual smorgasbord that amuses with its variety, but never sidetracks or detracts from the intent of the illustration. Unruh makes the color and black and white areas flow together in a coherent whole, as if the lines, hatching, spatters, squiggles and dots of pen and ink are just additional “colors” in his palette. There is an online article about him from the Sep/Oct 2002 issue of Graphis, and an interview on Illustration is Easy.